INTI International College Penang achieved 98.5% pass rate in the 2013 New South Wales Higher School Certificate (NSW HSC) exam. 36.7 percent achieved an ATAR (Australian Tertiary Admission Rank) of 80.00 and above which placed them among the top 20 percent of high achievers worldwide. Top NSW HSC achiever Chong Yee Ting flanked by Lem Shen Wei (left) and Michelle Danielle Min Tse Veerappan. Chong Yee Ting achieved the highest ATAR of 98.95. Lem Shen Wei and Michelle Danielle Min Tse Veerappan achieved ATARs of 95.55 and 94.30 respectively to be in second and third positions at INTI Penang. Yap Siew Hui, Lai Minrui, Clariss Wong Jenn Li, Lynette Kam Li Lin, Lim Wen Yih, Toh Rong Quan and Abelyn Soon Wi Lynn made up the other top 10 NSW HSC achievers at INTI Penang. “Students seeking a fast-track matriculation course leading to tertiary education should consider the New South Wales Higher School Certificate. Having completed this widely recognised one-year programme at INTI, which came highly recommended by my siblings, I can now achieve my dream of pursuing medical studies within a shorter period,” said Yee Ting. 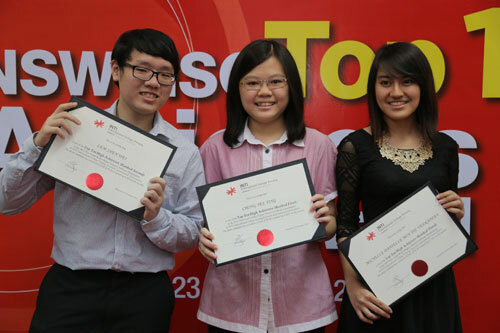 A total of 20 high distinctions were obtained by INTI’s NSW HSC students. 14 students obtained 5 As. INTI Penang achieved higher pass rates than that of the world in 10 subjects. Widely regarded as the most prestigious of the Australian matriculation credentials, NSW HSC is a qualification accepted by universities in Australia, New Zealand, the UK, USA, Canada, and India as well as Malaysian private universities into popular degree courses in medicine, pharmacy, engineering, business, IT and more. Entry into universities depends on the ATAR, a measure of the student’s overall performance in comparison with all students taking the NSW HSC. Comparable with the A level, NSW HSC can be completed in 11 months. At INTI Penang, a wide range of subjects is available in the sciences and commerce, and students may combine subjects from the two for broader options in tertiary studies. An attractive feature of NSW HSC is the assessment system which comprises 50% internal assessment based on assignments and projects at INTI Penang and 50% on an external final examination set and marked in Australia. The assessment marks awarded by INTI Penang are moderated against the final examination marks. The average of these two marks is used to determine the ATAR. Upon completion of NSW HSC, usually more than 25% of INTI’s students take up medical studies at first class universities like the University of Melbourne, University of New South Wales, University of Adelaide, Monash University and locally at International Medical University, Penang Medical College, Melaka-Manipal Medical College and Monash University Malaysia. For further information on NSW HSC, please call 04-6310138.